Christof Migone is an artist, curator and writer. His work and research delve into language, voice, bodies, performance, intimacy, complicity and endurance. 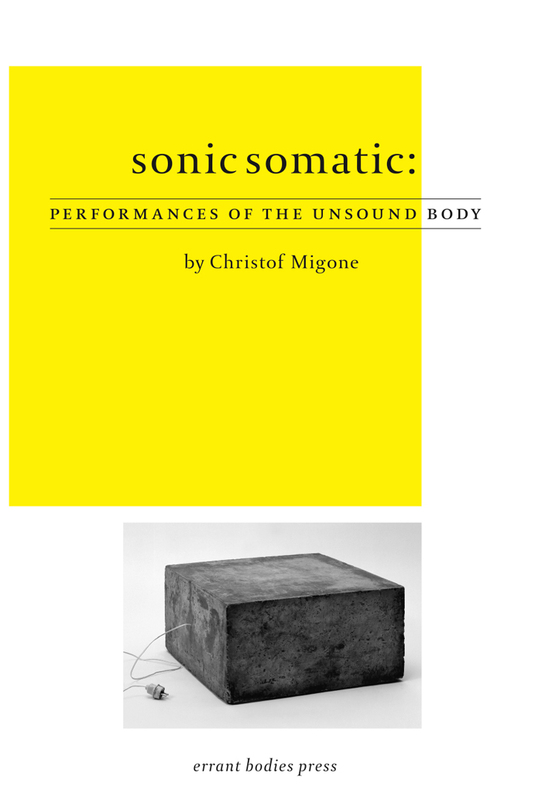 His recent book, Sonic Somatic: Performances of the Unsound Body was published in 2012 by Errant Bodies Press. He has presented work internationally and been the recipient of commissions from the Tate Modern, Dazibao, Kunstradio, Centre for Art Tapes, New Adventures in Sound Art, Radio Canada, New American Radio. He is also a founding member of Avatar (Québec City) and currently lives in Toronto as an Assistant Professor in the Department of Visual Arts, Western University in London, Ontario. ER. I’m interested to know where or when you became involved with sound as a subject and medium of artistic and curatorial interest? CM. I started doing radio at CKCU-FM in Ottawa in 1983. I was an undergraduate student at Carleton University. I began my studies in the sciences (I thought I wanted to be a biochemist), but an elective course in philosophy opened my horizons. I’m not sure if I had a specific interest in sound before this period. My involvement in radio and the discursive rigor of philosophy connect by way of language and the fact that my father was an simultaneous translator undoubtedly trickled through as well. The radio programming I was doing was fairly conventional at first (in a college-radio type format) but I learnt to edit reel-to-reel tape and started to do montages. The Production geeks at the station ran a half an hour show called No Wasted Words that focused on sound experiments. I did one program for the series. Simultaneously I was reading about the Situationists and other artistic avant-gardes as well as early Performance Art (through the Gregory Battcock anthology). 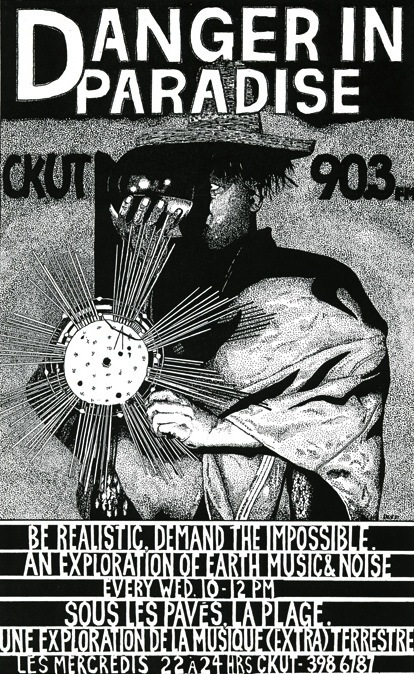 It was in 1987 when I moved to Montreal and started working at CKUT-FM that I fully embraced radio art in my program Danger in Paradise (named after the cassette release by General Strike with that title). In 1990 I co-curated Touch that Dial, the first exhibition I organized at the SAW Gallery in Ottawa. ER. Who or what were some of your other early reference points and did you feel there was a community or collectivised sense of “sound as art” during that time? CM. My mentors in the radio days were Dan Lander and Gregory Whitehead. Sonically and politically, in the 80s, definitely punk, particularly the fringes of all the genres: Lemon Kittens, Flipper, After Dinner, Throbbing Gristle, Einsturzende Neubauten, Crass, Rudimentary Peni, Skeleton Crew, Sun Ra, Prince Far I, On-U Sound, Ralph Records, Recommended Records, just to name those that come to mind. Dub’s use of the mixer and recording studio as instruments and its focus on frequencies (bass in particular) remain key. I’m not sure if ‘sound art’ as a term had currency then in my consciousness, though ‘radio art’ did, and that’s definitely related. I think more generally it was the sense of a commitment to experimentation, whatever the art form might be: pushing boundaries, or ignoring them altogether (however naive that might sound). Mixing, meshing, mashing disparate things together. Hybridizing as a way to escape the dangers of ossification. ER. I think one the first works I heard of yours was Hole in the Head, probably some years after its initial release. I believe it was originally made for radio? CM. Hole in the Head is two things, the work by that name was a commission by New American Radio. And the CD by that name includes this work as well as a few others. All were made for radio. The CD (as well as the eponymous work) includes a lot of material culled from the weekly radio program Danger in Paradise I did at CKUT-FM in Montreal from 1987 to 1994. I still have a large amount of reel to reel tapes and cassettes from the period; I hope to digitize it all some day. Hole in the Head mixed my burgeoning editing side (avoiding the term composition here) with an attempt to convey live radio in recorded form. Both are imbricated. ER. 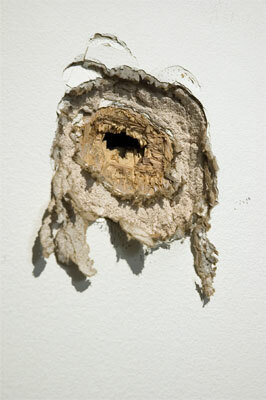 “Holes” re-occur throughout your practice. What is the significance of the “hole”, be it a hole in the wall or a bodily orifice, I’m wondering what this cavity or fissure means to you? CM. It’s a port of entry and exit. From a skin pore to a gaping mouth the body’s holeness is so much more significant that it’s supposed (but unattainable) wholeness. ER. What is your relationship to the radio now having worked so extensively with it as a space for art and not necessarily representation or conventional communication? CM. Radio informs everything I do but indirectly for the most part. Not only the creative use of the airspace but the collective project involved in running a broadcast facility: the consensus-decision making process, the fundraising, the activism, the volunteer work. ER. I’m wondering whether the limits of the radio pushed your practice into its later focus on the body – did the body become more important through its radiophonic limitation perhaps? CM. Radio can be reduced to a microphone and a mouth and a few inches in between. Once you get it in your head that this relationship could use some bending, then the microphone seeks other sound sources. ER. Works like Vex, Crackers and Snow Storm seem to draw out the sounding body as a site of performance. I’m curious to hear about your relationship to the habitual and everyday. Your work focuses in on a type of “infra-ordinary” body-sound-action i.e. cracking knuckles or scratching dandruff? CM. In a sense I was simply exploring sonic possibilities with whatever was around me. One’s body is immediately there. The body actions that I was (and still am) particularly drawn to are those we cannot control. For better or for worse, those often solicit reactions of disgust. I’ve never sought the latter on purpose; they just arise when certain orifices or fluids are featured. E.R. How did your doctorate at the Tisch School of Arts effect your practice? I’m thinking here about connecting to the body and perhaps the development of a writing practice? CM. My PhD was done at the Department of Performance Studies at NYU. Performance Studies and Cinema Studies are the two programs at Tisch that offer doctoral degrees. They are not practice-based degrees. It is a written dissertation that is produced; which became the Sonic Somatic book. I had completed my MFA at the Nova Scotia College of Art & Design and while I had a great experience there I felt a need to really plunge into theory, partly in order to anchor the writing practice that I had been developing in parallel to the radio work (so, before my master’s), and I think (retrospectively now) I implicitly knew that I wanted to teach. The reason I ended up in Performance Studies was principally Allen S. Weiss. He was my main advisor and a constant advocate for me. Plus we share sensibilities in terms of writing, which combines a belletristic approach without forsaken critical argumentation. I share his fondness for miniatures in writing; he’s especially adept at those. E.R. The title of your recent book mentions the term “unsound”. Can you describe what unsound is? My first installation, at the Banff Center, as part of Radio Rethink in 1992 was a faux confessional. And I framed it as a radio without a transmitter, in other words, a radiophonic site. Similarly, I used unsound as a way to focus on the sonic as opposed to sound. It’s not about dispensing with the materiality of sound at all really, just amplifying its range, especially discursively. The fact that unsound also means failure, flaw, and disease adds a layer that is welcome given that it returns us to the flesh—the messy side of sound. Unsound also links productively to the Body without Organs (Artaud, Deleuze/Guattari) and that can also be helpful. ER. There is a playfulness often apparent in your work. I’m thinking here of works such as South Winds and 4 Feet and 33 Inches. How important is play or inter-play in your practice? CM. I wouldn’t say it’s always there, but when it is, it seems to serve as a counterpoint to the more bodily. The body is such a contested territory, it is definitely not neutral, but rather than to dwell on the areas and behaviors that are contentious, I tend to gravitate to the minuscule, the heretofore ignored. One could say that this inclination stems from being in a position of relative privilege, and I wouldn’t disagree with that position. ER. Your work also encounters failure, which you have explored extensively through in language and the voice. I’m wondering, when failure becomes acknowledged and performed is it still a failure? How does failure function for you? CM. Failure is a useful filter. I’m not a purist about it, nor would I want to define it in order to be able to determine what constitute a proper failure or not. It can be interpreted, recuperated, perverted. Why not? What are the stakes in denying its fluidity? ER. How important is setting up some kind of process-based task or constraint within the production of a work? I’m thinking here for instance of Listening to Ray Bradbury’s Mars or your recent contribution to the exhibition “Writing Sound 2” called: The First Sentence and the Last Word. What is the function of “constraints” in your work? CM. My first constraint work, or at least the one that felt like a turning point for me was Crackers. There had been moments before, but that’s a fully-fledged one. The methodology of constraints is ubiquitous I think, it’s just not always acknowledged or foregrounded. The use of starting points, or operative guidelines to generate the work is at the core of the creative act. ER. I’m interested in your relationship to technology in that you often make apparent the mechanism of mediation and creatively miss-use, trash and de-mystify the “power” of technology. Can you talk about this? CM. I’m a lo- to no-tech kind of artist. The intention is not primarily to de-mystify but it’s a happenstance that I welcome. Access to technology is hugely important, especially in relation to gender. Gear masturbatory fetish talk is a bane that is thankfully eroding. ER. One of your latest works Hit Parade illustrates this. Can you talk about how that work developed into a mass participatory action? CM. The antecedent works were Microhole and Microfall, both from 2006. In these I used microphones performatively in a gallery situation during the install. What was exhibited were the traces of those performative gestures and the broken microphones, the shattered surfaces they had struck, and the sound of the process. The first Hit Parade came about somewhat on a whim, it seemed to fit better the context of the event I was invited to in Seoul than either of those previous works. I just knew I wanted to continue to work with microphones as a percussive tool, as a blunt instrument. And the fact that the gesture does not require any skill opens it up to group situations where the unpredictably of the collective is an element that I always find enriching. ER. Do you give instructions to participants? CM. The initial iterations had a bare bones score, or instruction: lie on the ground and hit it with the microphone one thousand times. It has evolved since, adding pauses of indeterminate length at every hundred, and other parameters. But the initial basic number goal remains. I typically get very little time with the performers beforehand, generally an hour, so keeping it simple is not only a penchant it’s also practical. I quite enjoy losing control of a piece once it starts. I suppose that’s the nature of most performing arts where interpreters are involved, it’s just seems the precipice is quite present here. I am planning a 12 hour version titled Hit for this fall’s edition of Nuit Blanche in Toronto. It will be substantially more complex because it will involve mixers as opposed to microphones going directly to amp speaker. The mixers will be able to diffuse and manipulate the amplified sound. ER. Hit Parade intervenes public/outdoor space but you are also very integrated in displaying works within galleries. Is there a preference for you? Do you think it’s productive to keep sound art in the gallery as much as out? CM. I don’t have a preference nor does productivity enter the equation. It’s always case-by-case. ER. And do you differentiate your own “identity” as a practitioner, researcher and curator, or see it all as one practice? CM. At the core I don’t differentiate between any of the hats I wear, but each calls for a different mode of being in the world. At the level of research they intersect all the time. E.R. What projects are you working on at present? I was the Director/Curator of the Blackwood Gallery at the University of Toronto Mississauga between 2008 and 2013, so I’ve taken a bit of a breather from curating since then. But I just did a small project called Ditto for New Adventures in Sound Art’s Cross-Wave series. As for artistic ones, I always tend to have a handful in progress. Quick present count: Greatest Hits (2xLP based on Hit Parade recordings out this fall hopefully); a series of phone works (continuation of Publick and Dial pieces I did recently); the Record Release 12-inch and 7-inch projects are in full swing and require a lot of my time for preparation, execution, and presentation; The First Sentence and the Last Word is ongoing; a collaboration with Marla Hlady; and Flipper, an overdue commission for a work based on the sound of books being flipped. ER. And finally Ear Room asks, what does the term sound art mean to you? CM. While I do appreciate Max Neuhaus’ polemical statement regarding the term, it is clearly here to stay. I relish this vexed moment of inception in fact (not that I want to pin down this as the single birthing of the field). In the over twenty years I have been active in the field I’ve been encouraged by the influx of women in all facets of the field: practitioners, historians and theorists. But ultimately I try not to have a stake in the term. The arbitrariness of territorial determinations seems to indicate its relative lack of importance. Sound as unsound.